PuTTY is an open source utility that allows you to SSH to your Linux server (remote) from a Windows machine. Download the PuTTY from the above link and double-click the file. If a box appears asking if you want to run it, select Run. o Host Name (or IP address) : Enter the Hostname/IP of the Linux server. Note: The hostname and server login details are sent to the administrative email account when the server is provisioned. Note: The SSH Port by default is 22. However, if you have changed the SSH port, please provide the custom port number in the Port textbox. 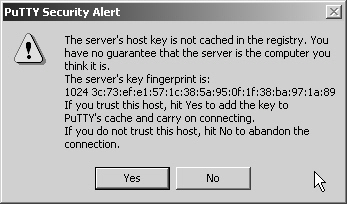 If this is the first time you have connected to this host from your computer, you may get a message similar to below. Click Yes and continue. The PuTTY terminal will now appear. Enter your user name (generally it will be ‘root’) and hit Enter. Enter the root password and hit Enter. If the login details are correct, you will be presented with Linux command prompt.